ONLY IN 1800 DID ROBERT SCOTT finally get around to adapting Gilbert Stuart's 1795 draped bust design—in a still more drastically oversimplified version than with the cents—to the half cents. Even then, the reverse was a left-over Gardner die of the 1795-97 type, the last appearance of this style wreath (single leaves at top) in American coinage. Some 5,750 of these were overstruck on cut-down spoiled cents, but an 1800 half cent with any trace of visible undertype is a great rarity. Spotty red Uncirculated examples, without undertype, are occasionally seen, from a small hoard found in New England in the 1930's. On the other hand, all the 1802's were struck on blanks cut down from spoiled cents, and we do occasionally see 1802's with visible cent undertypes—rarely attributable, though. 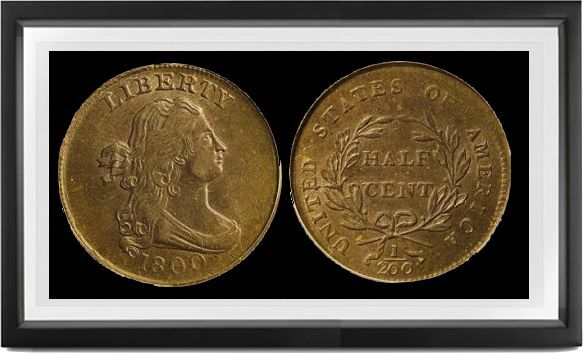 The variety with the worn-out Reverse of 1800 must have formed only a small part of the 8,200 coined August 8, 1802, as hardly a dozen survive today, all in low grades. The other variety is very hard to find above VG, HALF CENT generally being very weak; probably well below 1% survive of the total mintage (14,366 reported). The coins of 1803-06 are mostly commoner, smoother, and easier to find in upper grades, except for a few dies which failed almost at once. Most of them were coined on blanks furnished by Boulton & Watt (as with the better 1800's). Dies must have been of tougher steel, as the commonest reverse of all (the single Stemless die) was used in 1804, 5, & 6 and forms the majority of survivors of the last two, possibly nearly half the survivors of 1804 as well. Explanation for existence of the Stemless die is as on the cents; the partial hub used to make the wreath had no stems, so that these—as well as detail of berries and leaf stems—had to be added by hand. A single variety, the 1804 Plain 4, stemless, is commoner than any other half cent through 1857, and is readily available even in EF for a price—or at least it used to be. Uncirculated examples of these years are no longer readily found except for 1806 large 6 with stems to the wreath, of which Henry Chapman found a hoard (probably several hundred pieces) about 1906; these are mostly spotty red pieces with plenty of bag marks, weakly struck at upper wreath. The only true type coins of great rarity in these years are the 1805 small 5 with stems, and 1806 small 6, also with stems. These used to be considered extremely rare in any grade, but astute cherry-pickers in recent years have been finding low grade examples, pushing them down from Rarity 6 or 7 to low R-5. In grades above VF they are for practical purposes unobtainable, though. The large mintage reported for 1807 probably consisted mostly of coins dated 1806, a similar mixture of dates being known (through die break evidence) for previous years 1803-06. Coins dated 1807 are readily found in worn state but all but unknown in red Uncirculated or well struck; even brown AU or borderline Uncs. are typically weak, lacking much central hair detail, with blurred borders. Those dated 1808 are distinctive in several ways. This denomination represents the last appearance of the Draped Bust design—the only one for year 1808. There are two overdate varieties, the rarer (leaf nearly touches D) known to date only by a couple of broken die examples, which die must have begun to fail at once, as it was not in parallel plane to the obverse, and received maximal stress in the only area where the design comes up clearly. The other overdate is marked by development of an extreme "cud" rim break above BERTY. The normal date obverse was evidently made in 1806 or '07 with final digit omitted, the 8 punch breaking in the interim, as its final 8 seems to have been made from two small zeroes. Collectors still using one or another of the various reprints of the Gilbert book are likely to be vainly hunting for his No. 3 of 1808; the original coin (Brobston coll. ), offered at $250, ex Commodore Eaton and Gilbert coll.) proved to have a dent at the highest wave in Ms. Liberty's hair. On later states of the normal date variety, dies wear down so that only nine and later only seven berries can be made out. In all, an interesting group, perhaps less frustrating to the collector than the earlier types.